As we said in a recent post, long-form content has a whole range of advantages over its shorter, less informative peers. It seems that we was right after all, as one of the major social media platforms has provided its users with an effective way of publishing longer, higher-quality content as part of their personal social media and any other pages they run; i.e. business or fan pages. In August, Facebook began testing what was, essentially, a means of turnings its pre-existing 'notes' function into a real platform for the positioning of long-form writing. Now, whilst this might be exciting news for the average Facebook user, who can now share complete stories and experience easier than ever, it could provide a practical use for businesses that primarily operate through their Facebook presence. Now, we're not saying that Facebook businesses are going to take over the entirety of the eCommerce world, although there are certainly examples which state that it has the potential to be a massive contender when it comes to online retail. It is also true that the social media giant looks to be making efforts to make it an even more essential part of a user's life, thanks to native video hosting and a range of other added features. We do expect the largest social media platform to evolve, and start to revolve less around selfies, pictures of pets and shared news stories and become an even more essential tool for online businesses than it already is. Does Anyone Remember Facebook Notes? If you don't, we're really not that surprised. Facebook, if you can cast your mind back as far as pre-2011, used to have a character limit below that which it currently is (somewhere in the region of 60,000) and even then it was a huge character count. By 2011, the character limit had been raised to 5,000 characters, which really makes a tweet look insubstantial in comparison. As you can see, it was before 2009 that Facebook's character limit was actually restrictive, as users only had 160 characters to play with, which upgraded to 420 in 2009. Now, back in those days, Facebook status updates barely outweighed a tweet and it made sense for users to have a place to post longer pieces of writing that were still connected to their account. Notes, at the time, were a place to share in-depth thoughts and opinions (although there are extremely few of them which actually existed on social media at the time). They were more often used to take part in viral trends, such as the “X Random Things You Didn't Know About Me" that were pretty much all that the website was used for back in 2008. As the word limit gradually expanded on the status updates, these notes became less and less useful to users and were soon forgotten. However, all this time, they have been lurking in the background, quietly plotting for the day when they would be useful again. Fast forward to today and, after many years of laying in wait, the Notes platform is back and better than ever. The new system looks much more modern and much cleaner, with tons of white-space, larger images and a design that stretches across the entire page. In fact, they look less like the Notes of 2008 and more like self-contained blog posts. In fact, it has been suggested that the new Notes layout is based around the Medium platform. Medium is a blogging service which allows people to set up their own blogs and effectively engage with their audience and their contemporaries. Two of the major players in Medium's short history, Geoff Teehan and Jon Lax, are now both employed at Facebook, so it wasn't really a big leap to consider that the two are somehow involved. At the time of writing, however, there is no guarantee that Facebook weren't planning on moving into this space anyway, and that their acquisition of Teehan and Lax was simply a coincidence (cough, not likely, cough). Whilst the new Notes platform is still rolling out, not everyone has access to it as of yet, but those that do seem to be enjoying an easy to use platform which does bear a closer resemblance to a blogging system than the Facebook offerings of the past. The new layout places a huge focus on the content itself, and the interface for uploading your writing definitely looks more like a blogger or Wordpress content management system. Along with being much easier to upload and customise to your heart's content, they are also much more enjoyable to read and engage with. Of course, Facebook haven't stopped there – say what you want about the social media giant, but they never do things by halves! The platform is now testing new ways to tag people, resize photos, add links and even include hashtags within Notes, whilst retaining the same privacy controls. They are also focusing on keeping the privacy settings as simple as possible, with the option to share your Notes (maybe we should just start calling them posts, at this point?) with everyone, just your friends, a customised list of people or even just keep it to yourself. “... you can recap your summer vacation or an important time in your life to update the people you care about. You can voice your opinion on something you saw in the news or write an open letter you want to share with the world. You can share a special recipe with a bulleted list of ingredients and photos of each step." At the moment, these Notes can be accessed on mobile devices, but they can't actually be uploaded via a mobile device. Of course, as the programme is only slowly being rolled out, it is a certainty that mobile compatibility will be available before too long. Personally, we think that this lack of mobile accessibility hints at the development of a dedicated app for mobile devices. Not only would this give Facebook a much wider presence, but they could truly ensure that they can offer a complete unique experience via their own application. For example, you could take a picture and immediately upload it to the new app, and then quickly create a blog post about it, similar to the current way that status updates operate on mobile devices. What Else Could This Update Indicate? There is also the potential that, with a real platform to upload longer written content and effectively format images, status update could once again return to a restrictive character limit. This would certainly improve the overall quality of longer content, and encourage more and more people to really think about what they are writing, as they can upload images to accompany the post and format it as they would like it to be read – two features which are essentially missing from the current platform. The inclusion of a dedicated app also bears the potential for a personal and a business model, similar to the way that Wordpress operates. A paid business app could offer huge benefits to a business' social media marketing efforts, whilst a free, personal application would offer a wider range of benefits to the average user, and really make an impact on their levels of engagement with the online platform. Why Is Facebook Making This Long-Form Effort? For fan and company pages, it is worth noting that Google still searches and indexes Notes. Whilst it may not do it for personal pages, the search engine powerhouse certainly sees some value in the quality, number and relevance of these longer pieces of content as part of its algorithms. Since they offer you the opportunity to add content rich information to your page, it makes sense that Google would take these additions into consideration. In fact, there has been some suggestion that traditional SEO techniques, such as a very, very limited focus on keywords and a high-focus on readability will makes these Notes more useful to your page overall. With more and more businesses utilising Facebook as a major platform for online retail, along with a diverse range of other features, this update could be a great way to make these pages that much easier to find in search engines, and could actually be the next step in effective social media marketing. This new feature will not only help businesses and ensure that they place more of a focus on their Facebook presence, but will also place the social media platform into direct competition with platforms like Medium, Blogger and even Wordpress. 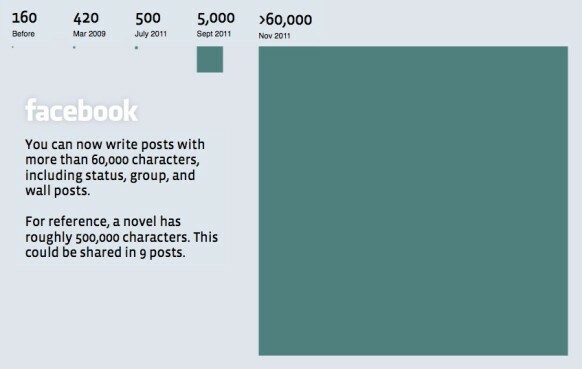 One thing is certain; this isn't the end for Facebook's focus on longer written content. Although we can't speak for everyone, we're extremely excited to see where this new feature goes and the changes that it will make to the value and quality of Facebook as a whole.